Music creation continues to evolve, with artists in diverse genres making creative use of technology to enhance their performances. Roland has for over thirty years been at the forefront of this development, producing instruments that have helped to launch many new styles of music. 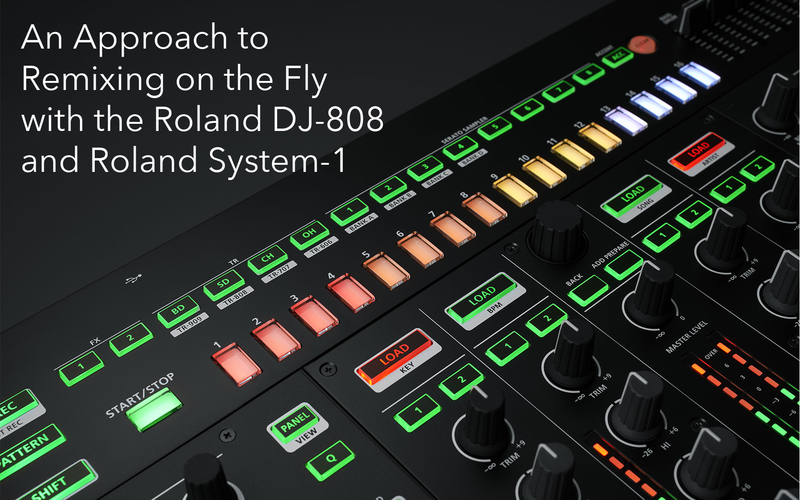 The Roland DJ-808, when paired with the Roland System-1 in an Aira system, provides a powerful platform for live remixing. In this post we look at an approach to doing a Remix on the Fly, using a combination of different mixes of our tracks, along with a set of samples loaded into a bank of the Sampler in Serato DJ Pro, and triggered by the TR-S section and Performance Pads of the DJ-808. We use Aira Link to connect the System-1 to the DJ-808 and sync the two instruments. The mixes we’ll use will be the main mix, a no-drums mix, and a mix of just the drums and percussion from the track, minus the kick. Of course this method is only possible when we can get our hands on, or create, all of these mixes. We could also use as the “drums only” mix a drum loop taken from a part of the track that breaks down to just drums. We’ve assembled all our loops in our DAW, in this case Ableton Live, to be sure they’re playing well together and edit them to our liking. Of course it’s up to you to decide if you want to quantize the loops, or leave the rhythmic variations the loops may have as they are. This will depend on the genre of music you’re doing as well. To set the sampling rate of our DAW for recording parts from the System-1, we create an Aggregate Device in the Audio MIDI Setup utility on our Mac. We have created an arpeggio stem using a sound from the Roland SH-101 Plug-Out running in Abelton Live. Having dialed in the sound and created the part in Live, we then send the SH-101 Plug-Out Model to the System-1 over USB from our computer, so we can play the same sound live on the System-1 as part of our remix on the fly. For this method we’ll be using Smart Sync in Serato DJ Pro, since there are so many elements being triggered so often, sync makes it much easier to keep multiple elements in time with each other while remixing on the fly. It is also important to analyze the files, and set beatgrids for all of the stems and mixes we’re using as remix elements in this kind of method. The Sampler Play Mode we’re using in the Serato DJ Sampler for the stems in this example is the ‘On/Off’ mode . In this mode we press a DJ-808 performance pad once to play the sample, and once again to stop playback of that sample. We’ll also make sure the Sync Buttons of the Serato DJ Sampler Slots containing the stems are activated so those Sync Buttons appear grey. In this way, when the samples in those slots are triggered, their Sync Buttons will change to blue, indicating sync is on, and the stems will play in sync with the other elements already playing. In this case we load our Main Mix into Deck 1 and our Drums Only Mix into Deck 2 of the DJ-808, the Serato DJ Sampler bank sounds use channel 3, and the System-1 uses channel 4. Of course there are virtually limitless possibilities in combining the remix elements, triggering them with the TR-S Sequencer and Performance Pads of the DJ-808, and playing various mixes of our track on the decks of the DJ-808.